Things get magically weird this week as the #BookSquad discusses Gingerbread by Helen Oyeyemi. We discuss childhood and nostalgia, friendship and family relationships, and what the heck is actually happening plot-wise. Plus, we talk about some of our own family recipes and get into Pet Sematary feedback. Head over to the #BookSquadBlog for more content, including TV recaps, book reviews and other miscellany. Next Up: HATEpisode #2! Rage-read along with us for Shari Lapena’s novel A Stranger in the House, coming up on the next othersode. On our next bookpisode, we’re covering An Absolutely Remarkable Thing by Hank Green. Check our social media on April 26 for a special giveaway featuring this book and pet-related goodies! Click through for summary, table of contents, and show notes! Get unburied with the #BookSquad (and special guest Charlie, Emily’s dad!) as we come back from the dead to talk about the new 2019 film adaptation of Stephen King’s Pet Sematary. We discuss grief, death and the big changes between the book (and the 1989 film) and the new movie. Plus, you get to learn a little about our childhood pets! Then we dig into some Captain Marvel listener feedback and tell you what’s on the #BookSquadBlog right now. Up next for our #bookpisode: Gingerbread by Helen Oyeyemi. Read along with us for that and for our next #othersode, where we’ll (probably) hate on Stranger in the House by Shari Lapena. Othersode #25: What's a cat? / Captain Marvel! The #BookSquad crash lands on planet C-53, aka Earth in the mid-90s, to talk about Captain Marvel, the newest origin story movie in the Marvel Cinematic Universe. 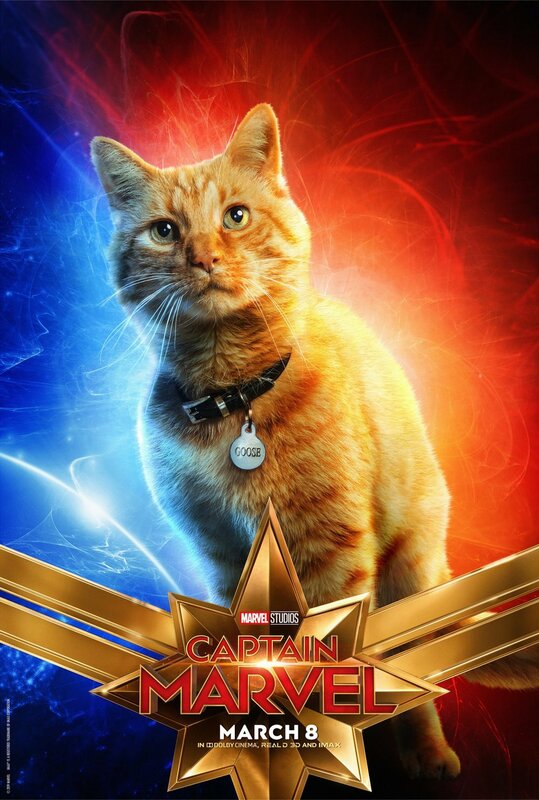 We discuss where this movie fits in the MCU, how it works as trauma narrative, the film's feminist themes, how it compares to other superhero origin stories, and — of course — Goose the cat! Plus, we give you a rundown of what's on the #BookSquadBlog (it's a lot of recaps!) and what's up next on the pod. Read along with us for our next #bookpisode on Fruit of the Drunken Tree by Ingrid Rojas Contreras. Our next #othersode will be on the remake of Pet Sematary, coming to theaters soon! Don't forget to rate, review and subscribe to the podcast, and send any listener feedback to us at thesquad@booksquadgoals.com. We want to hear from you! Feel like a townie with us as we go to Lackawanna, NY for a strange reunion of a group of childhood friends in Rebecca Kauffman’s novel, The Gunners. We talk about revealing secrets, character development, the problems with Mikey, and whether people can really change. Plus, we tell you all the goodies currently on the #BookSquadBlog. Go see Captain Marvel, and join us for our next #Othersode on 3/11/19! Email us your feedback to thesquad@booksquadgoals.com and don’t forget to rate, review, and subscribe! Click through for table of contents and show notes! Things get downright whimsical this week as the #BookSquad plays Magical Fury with special guest Todd! Join Becky, Kitty, Heather and Hook at North Bay High School as they encounter a ~strange happening~ and transform into magical girls to battle with some unsavory creatures. We'll let you decide who has the coolest magical girl powers after you listen. After the magic dust settles, we cover what's on the #BookSquadBlog and what's next on the podcast. Write to us about anything you'd like at thesquad@booksquadgoals.com, and don't forget to rate, review and subscribe! What if women all across the world were suddenly given the power of electricity? The Book Squad entertains this question and so many more as they dive into Naomi Alderman’s speculative alternate history novel The Power. Get ready, because we’re going to talk about race, we’re going to talk about gender, and we’re going to talk about erections. You don’t want to miss out on this. Plus, we get into a little Riverdale and Bachelor chat as we discuss what’s going on in the blog world, and coming up on our next ‘pisode: the launch of #BookSquadGames, starring friend of the pod, Todd! Be sure to rate, review, subscribe, and love us. We love you! Come with the #BookSquad on a not-so-luxurious European vacation to 1950s postwar Naples, Italy to discuss the HBO series My Brilliant Friend. We talk female friendship (and frenemy-ship), toxic masculinity, and the show’s (forgive us) brilliant choices in setting, design, and photography. And of course, we answer the most important question: F*ck, Marry, Kill: Stefano, Nino, and Marcello? Yes, we fully expect you to write in with your answers. After the show, we get into listener feedback on Suspiria and read your favorite things of 2018. Mary tells us about Lemuria, this month’s featured bookstore, and we break down what’s on the #BookSquadBlog right now. Be sure to start reading Naomi Alderman’s The Power for our next bookpisode! Finish 2018 the right way: with the story of a powerful friendship and #squadgoals. In our final episode of the year, the Squad discusses Girls Burn Brighter by Shobha Rao. We talk about the novel’s themes, including grief, light/dark, and hope, as well as Rao’s writing style. We get into what shapes and drives the two main characters, and of course, we discuss the harrowing (seriously, it’s really bad) journey the women endure as they try to find one another again. Plus, we’ve got listener feedback on Little Fires Everywhere and Suspiria. Watch My Brilliant Friend on HBO for our next #othersode and read The Power by Naomi Alderman for our next #bookpisode! It's time for our second annual End-of-the-Year celebration here at the Book Squad Goals clubhouse. Grab a hot cuppa tea and/or a tall glass of wine and party with us as we go through our favorite things of 2018. And then... we open presents! Sorry, we didn't get you anything. This is awkward. Please don't forget to rate, review, subscribe and come back for our final episode of the year when we'll be discussing Shobha Rao's novel "Girls Burn Brighter"!